– Okusama ga Seitokaichou! +! Tags:anime, anitore ex, fall 2016, fate/kaleid liner prisma ilya, gakuen handsome, girlish number, hibike! euphonium, idol memories, keijo!!!!!!! !, kin-iro mosaic, koe no katachi, mahou shoujo ikusei keikaku, mahou shoujo nante mou ii desu kara., nanoha, okusama ga seito kaichou, planetarian, stella no mahou, strike witches, teekyuu, working!! – Mahou Shoujo Nante Mou Ii Desu Kara. – Durarara!! x2 Ten Gaiden?! Tags:anime, ao no kanato no four rhythm, dagashi kashi, durarara, haruchika: haruta to chika wa seishun suru, hibike! euphonium, mahou shoujo nante mou ii desu kara., okusama ga seito kaichou, ooyasan wa shishunki!, ore ga ojou-sama gakkou ni shomin sample toshite gets sareta ken, oshiete! galko-chan, shoujo-tachi wa kouya wo mezasu, tamayura, tantei opera milky holmes, winter 2016, working!! This is going to be pretty short. Most of the shows I watched this season carry over into Winter. 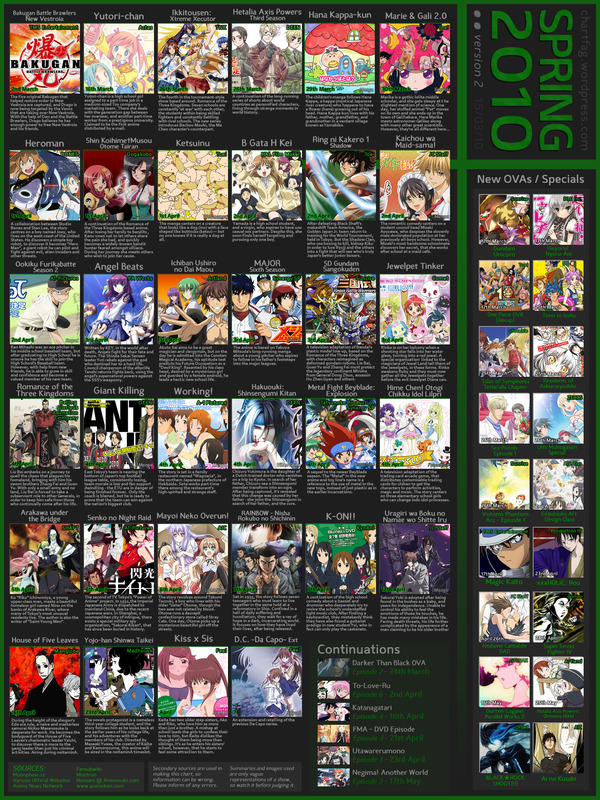 Tags:anime, ben-to, boku wa tomodachi ga sukunai, c3 -cube x cursed x curious-, fall 2011, idolmaster, shinryaku! ika musume, tamayura, working!! As usual, chart is courtesy of cowboybibimbop. Another season, another set of stuff I’ll be wasting my valuable free time with. Shinryaku!? Ika Musume – Second season of one of the best shows of last year. Oh hell yes. Bakuman 2 – Pretty much the same as above. Second season of one of the best shows of last year. C3 -Cube x Cursed x Curious- – Yeah, I dunno. I saw a preview, I guess I just wanna see if it’s worth watching. I really don’t know jack squat about it and none of the descriptions are really very informative. WORKING’!! – Second season of WORKING!! Already seen the first episode of this from the pre-air. It feels a little more balanced in character focus so far, but of course it’s the first episode, and it had to serve to reintroduce characters and stuff. There’s no guarantee it won’t slip right back into the awful Inami focus while it completely ignores everyone else just like the first season did, but I’ll give it a shot and hope it doesn’t disappoint. Fate/Zero – I had every intention of reading the novels once they were fully translated, but I just haven’t had the time. I may try to squeeze them in before the anime gets too far into itself because I want to be familiar with the source material, but regardless of whether I do or not, a Fate series prequel written by Gen Urobuchi with all of the praise I’ve seen it given is an absolute must-watch. 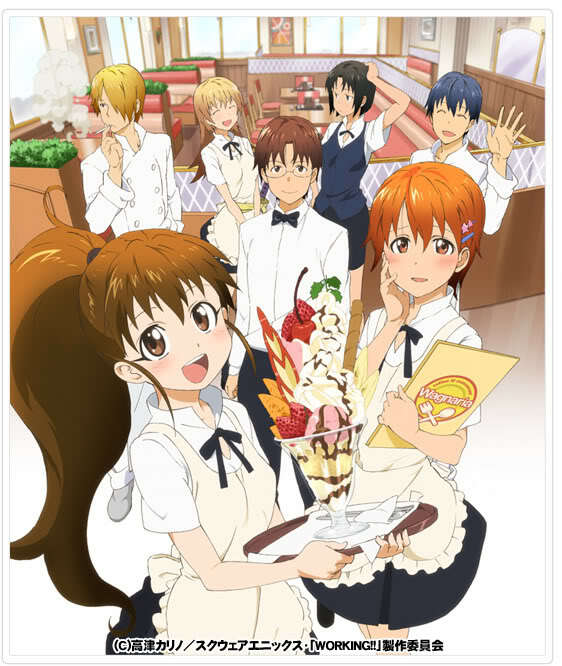 Tamayura ~hitotose~ – I sat down to watch the OVA series of this a few months ago after I heard people mention that it was getting a TV series and I have to say that I was highly impressed. I absolutely loved it and I am seriously looking forward to this series. I really hope it lives up to the standards set by the OVAs, because if it does then it’s going to be one of the best shows this season. Boku wa Tomodachi ga Sukunai – I’m pretty much just watching this one on the hype built around it. A lot of people are talking about it and I just really want to see what all of the fuss is about. Also, the artist for the novels is the same as the artist for the Denpa Onna novels and you can really see that in the art for this series. I really liked that art style, so I’m also drawn to this. Shame we won’t have some excellent Shaft angles to go along with it, though. Mirai Nikki – I still want to get around to reading all of the rest of the manga I have before this gets going (so yay, another barrier for the season alongside the Fate/Zero novels), but definitely interested in this. Guilty Crown – Supercell, Supercell everywhere. I was initially attracted to this series for the character designs, but Supercell’s name being plastered all over it (which of course means Ryo is doing the music) means that there’s absolutely zero reason for me not to watch this. One of the series I’m most excited about this season. Hidamari Sketch x SP – Always up for more Hidamari Sketch. Also can’t wait for the fourth season that’s been announced. – Astarotte no Omocha! EX – Actually already saw this. – Kami Nomi zo Shiru Sekai: Yonin to Idol – I had no idea this was already out. Gonna watch it shortly. Nothing else I’m interested in so far, but as usual, we’ll see if I pick up something else as the season goes on. Tags:anime, astarotte no omocha!, baka to test to shoukanjuu, bakuman, boku wa tomodachi ga sukunai, c3 -cube x cursed x curious-, carnival phantasm, fall 2011, fate-stay night, fate/zero, guilty crown, gundam unicorn, hidamari sketch, higurashi no naku koro ni, Ikoku Meiro no Croisée, is: infinite stratos, kimi ni todoke, mirai nikki, seitokai yakuindomo, shinryaku! 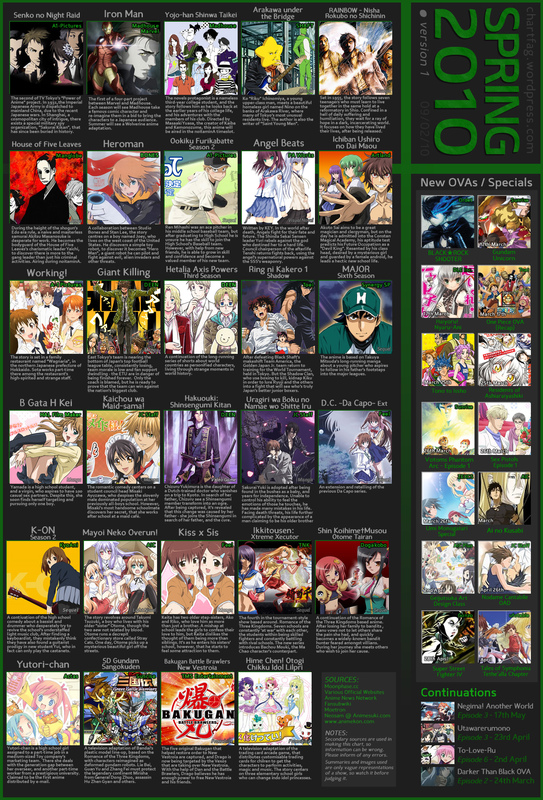 ika musume, tamayura, the world god only knows, usagi drop, wandering son, working!! Okay, finally getting around to this. It took a while because Mayoi Neko Overrun’s last episode took a full week to get subbed. I’m going to go ahead and note that I won’t be giving my impressions of Senkou no Night Raid here because half of the series is still left unsubbed. Tags:angel beats, anime, arakawa under the bridge, b gata h kei, bakemonogatari, durarara, ichiban ushiro no daimaou, kiss x sis, macross frontier, mayoi neko overrun, princess tutu, rozen maiden, spring 2010, taishou yakyuu musume, tengen toppa gurren lagann, valkyria chronicles, working!! I might have split this before, but it took so long for Rainbow’s subs to come out that I decided I should just do it all at once. Tags:angel beats, anime, arakawa under the bridge, b gata h kei, heroman, ichiban ushiro no daimaou, k-on!, kaichou wa maid-sama, kiss x sis, mayoi neko overrun, rainbow, senko no night raid, spring 2010, working!! So Working!! had an advance airing yesterday of episode 1. The show doesn’t really start until April, but I thought I’d take a look and see if it was really something I wanted to follow this season. So we have the new season’s chart all made up and pretty. Guess it’s time to decide what I’ll be keeping my eye on in the upcoming season. Senko no Night Raid – Not too sure what I think about this one just yet, but there seems to be a lot of hype around it, so I’m definitely going to have to check it out. Angel Beats – KEY anime. Kinda have to check it out. It seems to feature a gun-toting Haruhi clone. Actually, it does look pretty interesting, and I’m primarily keeping an eye on it out of interest. Working!! – Most people don’t seem to have any interest in this. I never see it on anyone’s list of stuff they’re planning to check out. It looks interesting enough to me. Of course, not knowing much about it, all I can say is it looks kinda comedy/slice-of-lifey and those are right up my alley, though not necessarily up everyone else’s. B Gata H Kei – I have to check this one out on premise alone. I hear she drops the whole “100 partners” idea very soon into the series, but with an opening premise like that, it could still deliver some interesting results, even if most of it drags out without it. K-ON! Season 2 – Now we’ve hit the big time. Probably the show most looked forward to this season globally. Not much to say here other than yay more silly slice-of-life and hopefully some great new songs. Kiss x Sis – I haven’t checked out the OVAs for this yet, but I’ll try my best to follow the TV series. Sounds interesting enough, but I haven’t gotten around to touching any of it, even the manga. Negima! Another World OVA 3 – Too far out there as it stands, but definitely looking forward to it. Everything else is pretty much going to be watched on a recommendation basis. I have no immediate intention of checking out anything else (except maybe the extended version of Da Capo, but even that will be held off until I can check the opinions of others). Tags:angel beats, anime, b gata h kei, k-on!, kiss x sis, Negima, senko no night raid, spring 2010, working! !